Senior Kelsie Nielson jumps into the air to spike the ball in the state championship volleyball match between North Sanpete and Morgan. To Nielson’s side is Aubree Ison, one of the stars of the Hawk effort this year. North Sanpete lost the match, 3-0, to come in second in 3A. 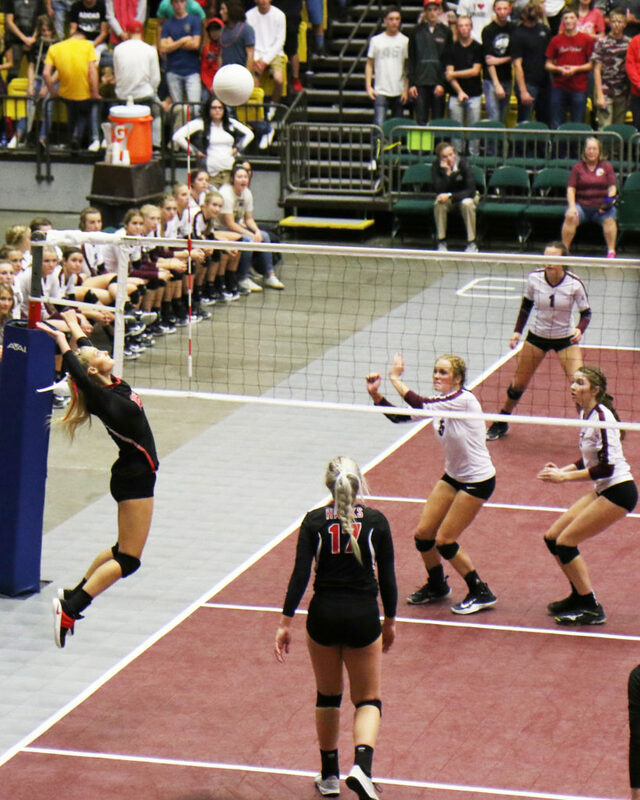 OREM—Making their fifth straight appearance in the state finals, the North Sanpete girls volleyball team fell short last Thursday, Oct. 26, to lose the championship match to Morgan High School, 3-0, and finish second in 3A. Morgan High, which did not lose a game during the entire tournament, got a fast start in the first game of the match, while the Lady Hawks appeared jittery. “I think we got caught up in the moment instead of realizing it’s a game,” said Lady Hawks coach Rickie Stewart. Morgan won the first game 25-11. Morgan got a fast start in the second game as well. Its strong front line dominated the net, and the Lady Hawks could not find an answer to their play. Morgan won the second game 25-11, the same score as the first game. In the third game, however, the Lady Hawks overcame their nerves and got out to a 5-1 lead of their own. After forcing a Morgan time-out, the Lady Hawks fought tough with Morgan for the rest of the game, passing the lead back and forth throughout. Morgan got out to a 19-17 lead, and managed to preserve that lead to the end of the game, 25-21, which gave them the championship. Stewart praised the play of the seniors, and singled out Shelby Ison as the best player on the team. “We put a lot of pressure on her” in the tournament to get to the finals, the coach said.